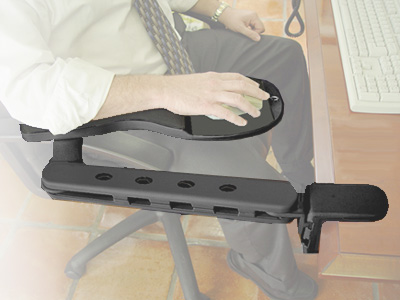 True Arm is revolutionary in ergonomic support products. 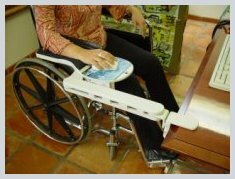 It is specifically designed to benefit all computer users including the Physically Challenged computer users on wheel chairs. This uniquely designed ergonomic arm support is the only one of it's kind in the market that can help alleviate Upper Body Stress Syndrome associated with repetitive motion. Upper Body Stress Syndrome can lead to Carpal Tunnel Syndrome (CTS) and other Repetitive Stress Injuries (RSI). True Arm is truly unique, allowing the use of the computer mouse off the desk in several relaxing positions. The True Arm allows you to sit back and bring the mouse to you, thereby alleviating the strain on the back and spine. With your wrist properly aligned and in a neutral position, there are less pressure points, muscle tension or restricted blood circulation, which are the main causes of "CTS". This innovative product helps alleviate Carpal tunnel Syndrome (CTS) and Repetitive Stress Injuries (RSI) associated with the use of the computer mouse. Total shoulder and arm support. A relaxing and proper sitting posture. Exact alignment of hand and forearm. Safe sitting distance from the monitor. Microwavable bean bag arm rest for greater comfort.